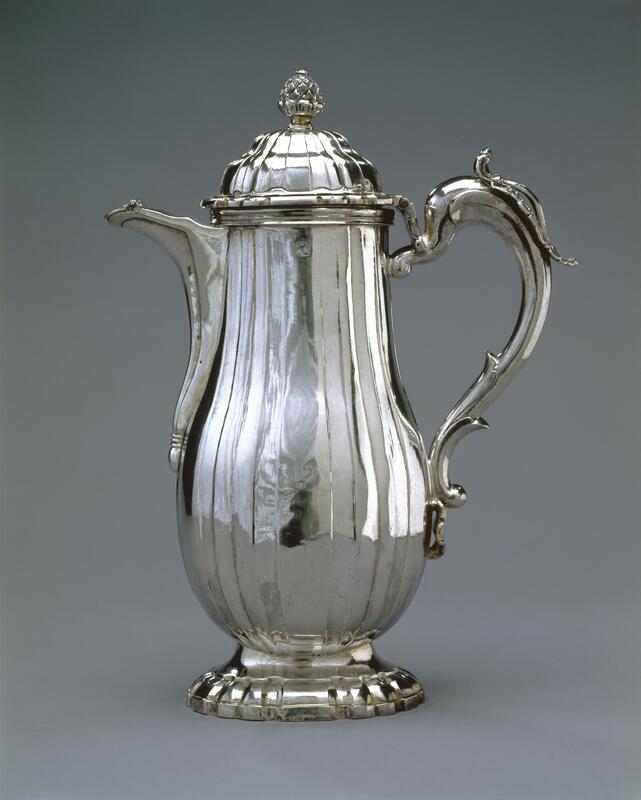 This coffee pot was cast by the silversmith Miguel Guerra in Guatemala around 1780. Like many of the most skilled silver-workers in Spanish America, Guerra followed European models. Guerra’s design is particularly elegant: the sharp body pleats are set off by a swooping, curving handle and spout. The elongated oval of the body is typical of designs in the Rococo style. The top of the pot is crowned with an artichoke-shaped finial. 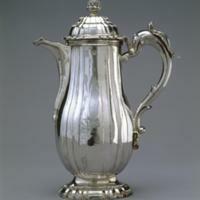 Spanish American silver was very pure, with only about 7.5% alloy added. As a result, pieces often have a bluish sheen. Miguel Guerra worked in Guatemala at the end of the 18th century. Like other master silversmiths, he signed his works with a distinctive stamp pressed into the silver. While silversmiths of the 17th and 18th century made their reputations with church pieces—monstrances, retables (retablos), and processional crosses—they welcomed the income from pieces like this one, made for a high-status household. The piece was cast out of silver and as a result is quite heavy. Pieces made in Spanish America had to be assayed—that is, tested for purity. Typically, an assayer would leave a small serrated incision on the underside of a vessel. Little is known about the history of this vessel. However, it is in beautiful condition, and was probably a prized object in a wealthy household until it came into the collection of the Museum of International Folk Art in Santa Fe. The vessel bears silent witness the economic foundations of the wealthy Spanish American household—silver was the engine driving the Spanish American economy, supplemented by delectable crops sold at home and abroad like coffee, sugar and chocolate. Reproduced courtesy of the International Folk Art Foundation Collection in the Museum of International Folk Art, a unit of the Museum of New Mexico, Santa Fe. Photo by Blair Clark. Palmer, Gabrielle and Donna Pierce. 1992. Cambios: The Spirit of Transformation in Spanish Colonial Art. Santa Barbara: Santa Barbara Museum of Art. Platería Novohispana: Museo Nacional del Virreinato Tepotzotlán. 1999. Tepotzotlán: Museo Nacional del Virreinato.